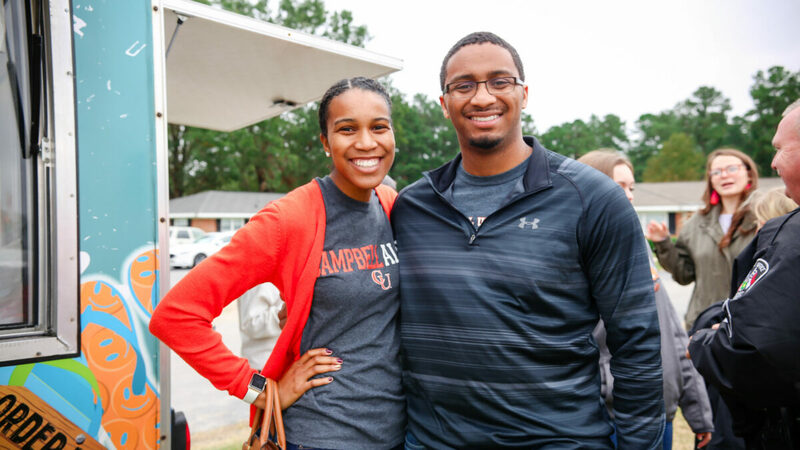 On Saturday, October 27, the Campbell University Office of Alumni Engagement welcomed alumni home to Campbell for a series of Homecoming events. The morning began with an Alumni Open House at 10 a.m. at the Office of Alumni Engagement’s new home, the Cornelia Campbell Alumni House. Breakfast foods, coffee, and campus walking tours were provided during the event. There was also an opportunity to shop for Campbell Alumni gear with the Campbell University Bookstore. Immediately following the parade, thousands of Campbell alumni and friends were welcomed to our biggest celebration of the year – Alumni Village at Homecoming! This year’s event featured Homecoming Reunions for ’78, ’93, ’08, & the Golden Club, a Campbell Fraternity and Sorority Life Alumni Celebration, music by Bantum Rooster, food trucks, and more! We hope that you enjoy this photo recap of Homecoming 2018. And if you did not get to join us this year, be sure to mark your calendars for next year’s celebration on October 19, 2019!